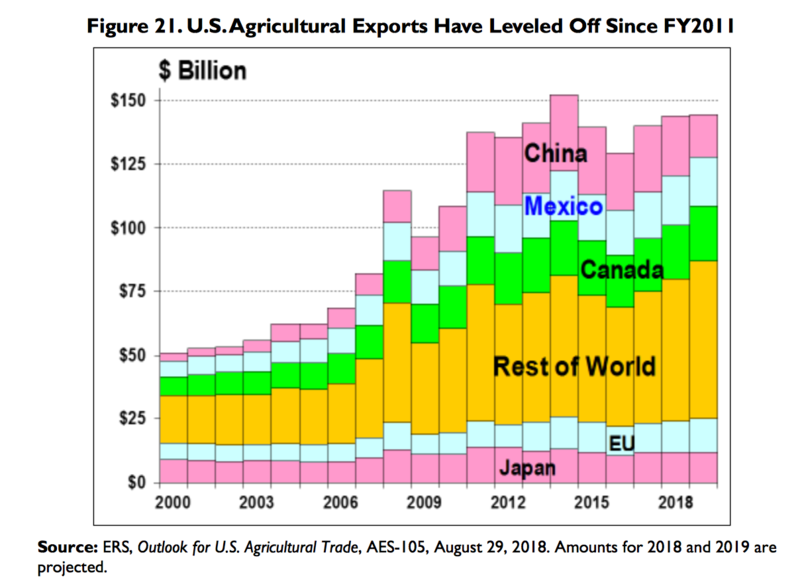 Recent news articles have discussed USDA’s trade aid package, as well as the potential impacts of ongoing trade tariffs on U.S. farm goods. Today’s update provides an overview of several of these articles. 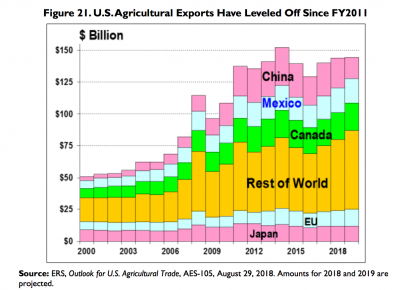 Wall Street Journal writer Jesse Newman reported late last week that, “The Trump administration has started compensating U.S. farmers for damage tariffs are doing to their business. “Many farmers say the payments won’t make up for lost sales to China and other foreign markets they were counting on to buy the huge amounts of crops and meat being produced across the Farm Belt. “U.S. 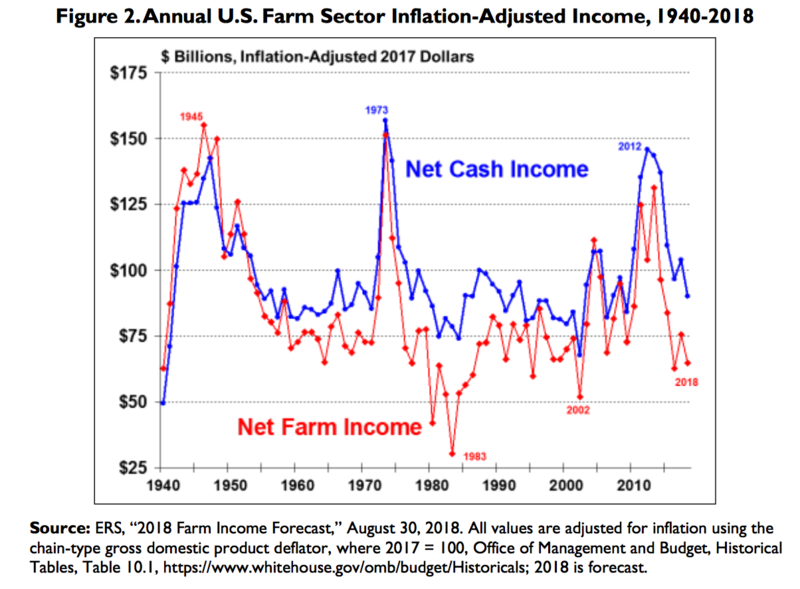 Farm Income Outlook for 2018.” Congressional Research Service (September 21, 2018). 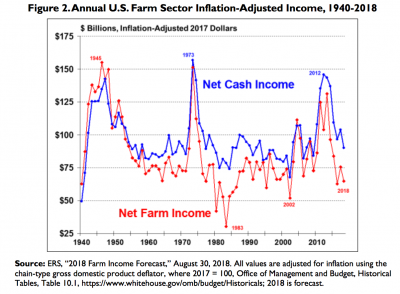 The Journal article pointed out that, “The USDA in August said it would pay farmers nearly $5 billion to offset losses from global trade disputes. 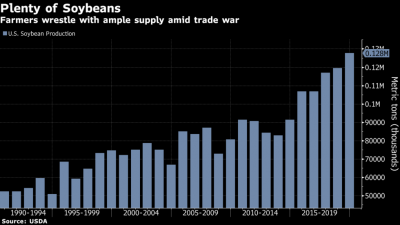 Major U.S. trade partners including China, Canada and Mexico have applied tariffs to billions of dollars’ worth of U.S. agricultural exports in retaliation for tariffs imposed by Washington. The U.S. and China vowed last week to put more tariffs on each other’s goods. 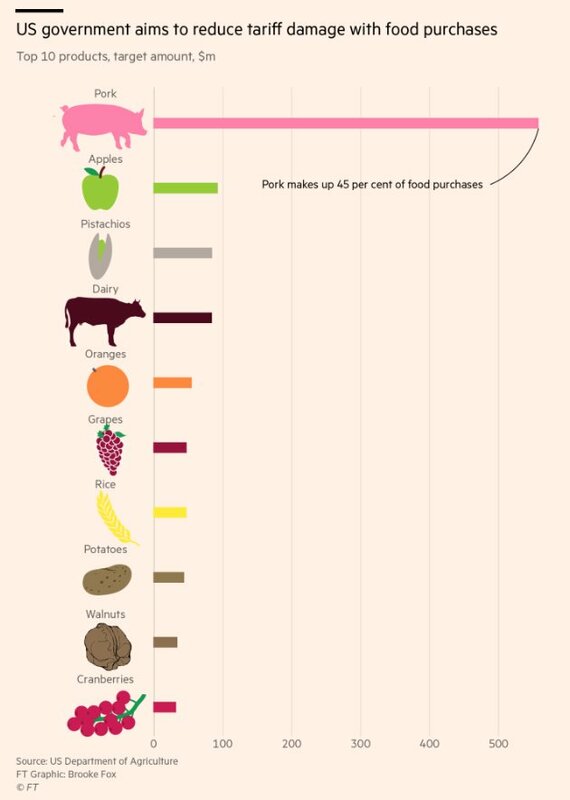 Pork makes up 45% of food purchases. “Trump’s trade wars fill US food banks to overflowing,” by Gregory Meyer. The Financial Times (September 30, 2018). Bloomberg writer Deena Shanker reported Friday that, “Attending the Global Food Forum in New York this week, [Beth Ford, chief executive officer of Minnesota-based agriculture cooperative Land O’Lakes Inc.] said the Trump administration’s compensation package falls short of the losses being incurred by producers, many of whom can’t simply wait for tariffs to be lifted. Meanwhile, Bloomberg writers Deena Shanker and Mario Parker reported Thursday that, “U.S. soybean growers who are starting to harvest what’s predicted to be a bumper crop probably will look to weather the trade war with China by stashing away the oilseed, according to agribusiness giant Bunge Ltd.
“Farmers Will Hoard Beans to Ride Out Trade War, Bunge CEO Says,” by Deena Shanker and Mario Parker. Bloomberg News (September 27, 2018). “U.S. 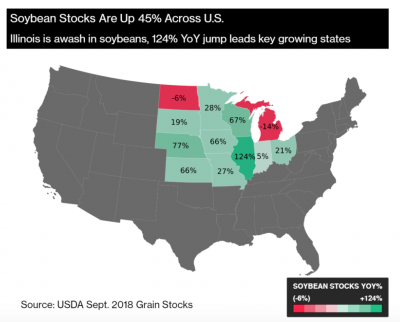 Soy Inventory Balloons, Led by 124% Gain in Illinois,” by Kevin Varley and Shruti Singh. Bloomberg News (September 28, 2018). And as this battle goes on, some see increased export opportunities for Canadian producers, as well as increased production and exports of some agricultural commodities from a resurgent Russia. Today's update looks briefly at recent reports that discuss variables associated with U.S. soybean exports. In addition, news items that highlight concerns about crop storage issues, and the trade policy outlook, are also noted.